Ok here’s a funny story. 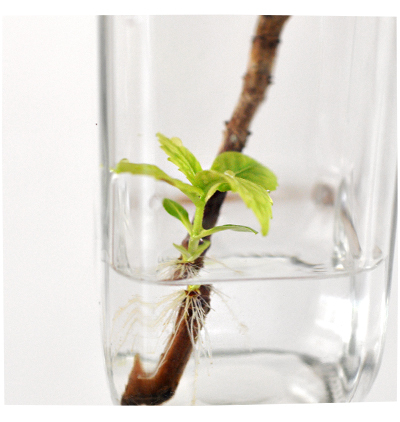 Before I left for my 4 week long trip to London and Paris (in January)… I snipped off a pretty hydrangea flower stem from my garden, placed it into a tall jar of water and left it in my laundry. Then I hopped on a plane and left my husband and three kids at home. I noticed that no one thought to throw out the rotting stem?! But I also noticed that a baby hydrangea had sprouted! I didn’t know hydrangeas grew from stem cuttings! 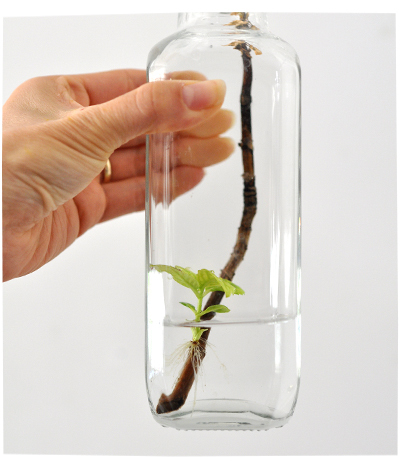 And I wouldn’t have known this because… I would have NEVER left a rotten stick in a jar of water for 4 weeks!! !